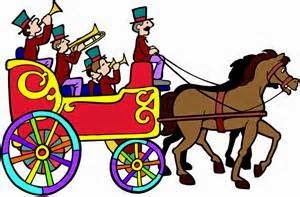 Idiom: "jump on the bandwagon"
Carlos: Did you watch the Kings game last night? Tommy: I thought you didn't watch hockey. Carlos: Well, I didn't before. But now that they're winning, so it's fun to watch. Tommy: Oh, so you just jumped on the bandwagon. You're not really a fan. Carlos: What do you mean? Tommy: You didn't follow them all season. You just watch them now because they're winning. You just jumped on the bandwagon. Carlos: Wow! You're so critical. Kyle: I hate this football season. Kyle: The stadium was much more comfortable and empty before everyone jumped on the bandwagon. Crystal: But it's good for the team. Also, the stadium can make some money. They need to fix it anyway. Kyle: It doesn't matter. I don't like people who do something just because it's popular and not because they actually care. Meaning: join a popular trend or activity.